Purpose EasyPfu DNA Polymerase is an engineered version of Pfu DNA Polymerase with enhanced yield and higher fidelity. Specificity EasyPfu DNAPolymerase possesses a proofreading 3'-5' exonuclease activity. Characteristics - EasyPfu DNA Polymerase offers 18-fold fidelity as compared to EasyTaq® DNA Polymerase. - Extension rate is about 0.5 kb/min. 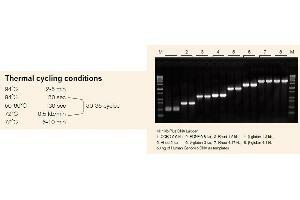 - PCR products can be directly cloned into pEASY®-Blunt vectors. - Amplification of genomic DNA fragment up to 6 kb. - Amplification of plasmid DNA fragment up to 10 kb. Unit Definition One unit of EasyPfu DNA Polymerase incorporates 10 nmol of deoxyribonucleotide into acid-precipitable material in 30 minutes at 74°C. EasyPfu DNA Polymerase has passed the following quality control assays: functional absence of double- and single-strand endonuclease activity, >99% homogeneous measured by SDS-PAGE. Each batch of EasyPfu DNA Polymerase has been assayed for amplification efficiency to amplify p53 gene from 10 ng of human genomic DNA.